The New Year’s Eve is not about going to loud, poorly lit parties, to scream, dance and celebrate with strangers. It is the time to think about the past year, the mistakes, the lessons learnt, the memories made, and the achievements with people who matter. And this can happen only in a calm and serene space. So this New Year’s eve step away from the clichéd celebrations and take time out to spend with your family, friends, and kids. Head to the New Year Gala Dinner @ Qube Siesta Hitech and re-bond over a delicious meal. Qube Café is hosting this Gala Dinner with “Roast Duck and several other Hyderabadi Specials,” that will be served along with a sumptuous buffet spread. 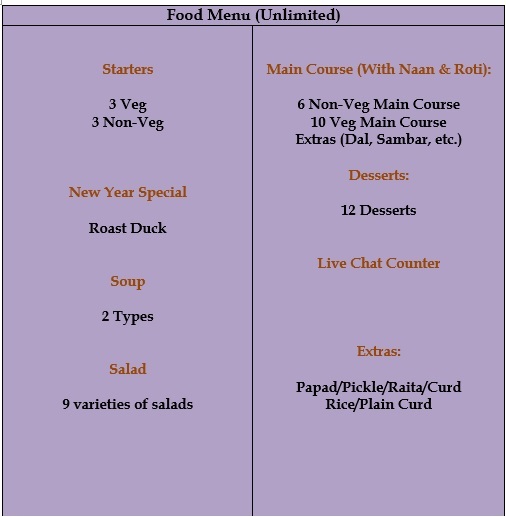 So bring your loved one and come over to Qube cafe @ Siesta Hitech for a soothing beautiful Gala Dinner and a remarkable start for the New Year 2016. Well, we do agree that no New Year party is ever complete without a drink or two, which is why you will be served a mock tail and the cost of this will be on the house. So, cheers to that! Other attractions at this gala dinner include candlelight gala dinner with lavish buffet spread, flowers and chocolates on the table.